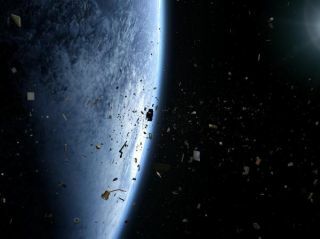 Space can be sprinkled with jagged junk resulting from satellite collisions. Work is underway to create a spacecraft that won't be rocketed into outer space but will be purposely destroyed on the ground. DebriSat is a 110-pound (50 kilograms) satellite that's a double for a modern low-Earth orbit spacecraft in terms of its components, materials used, and fabrication procedures. But once fabricated and tested, DebriSat is doomed. Liou pointed out that the Department of Defense (DoD) and NASA have conducted quite a few laboratory-based impact tests in the past. One of the key experiments supporting the development of the NASA and DoD satellite breakup models was called SOCIT, short for Satellite Orbital debris Characterization Impact Test series. In one SOCIT ground experiment in 1992, the target was a flight-ready U.S. Navy Transit satellite built in the 1960s. But that was then, and this is now. Present day satellites incorporate many different technologies and materials than spacecraft designed over 40 years ago. "As new materials and new construction techniques are developed for modern satellites, there is a need to conduct additional laboratory-based tests and use the new data to further enhance the breakup models," Liou said. DebriSat is built to be busted up, designed to yield new data on on-orbit collisions. A University of Florida team is designing and fabricating DebriSat for its eventual demise. To put DebriSat together, a wide-ranging study was done of past low-Earth orbit satellite designs and missions within the last 15 years for spacecraft ranging from one kilogram to 5,000 kilograms (2.2 pounds to 11,023 pounds). This study identified modern trends in hardware, material, and construction practices utilized in recent LEO missions. While DebriSat is an engineering model, specific attention is being placed on the quality, type, and quantity of the materials used in its fabrication to ensure the integrity of the destructive outcome. DebriSat is now slated to undergo a hypervelocity impact test in early 2014, said Norman Fitz-Coy, associate professor in the Department of Mechanical and Aerospace Engineering and director of the Space Systems Group at the University of Florida, which is in Gainesville. He is leading the university's DebriSat team. A hypervelocity impact test is one in which the amount of energy experienced during a typical impact between two orbiting satellites is replicated, Fitz-Coy told SPACE.com. The test will be performed at the Air Force's Arnold Engineering Development Center in Tennessee. "We are not actually gluing the satellite back together," Fitz-Coy said. "Rather we are characterizing — size, shape, etc. — of the fragments resulting from the impact. This is a labor intensive exercise." NASA's Liou said that after the hypervelocity test, the University of Florida experts will collect fragments down to roughly 0.08 inches (2 millimeters) in size. That's about as long as a nickel is thick. The dimensions of the resulting fragments will then be measured individually. That data will be delivered to NASA and the Air Force Space and Missile Systems Center. The NASA Orbital Debris Program Office will lead the effort to analyze the data and use the information to enhance the satellite breakup model, Liou said.